The recession isn't over, but is capitalism? Capitalism has generated massive wealth for some, but it’s devastated the planet and has failed to improve human well-being at scale. Species are going extinct at a rate 1,000 times faster than that of the natural rate over the previous 65 million years (see Center for Health and the Global Environment at Harvard Medical School). Since 2000, 6 million hectares of primary forest have been lost each year. That’s 14,826,322 acres, or just less than the entire state of West Virginia (see the 2010 assessment by the Food and Agricultural Organization of the UN). 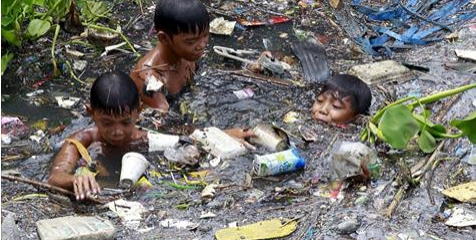 Even in the U.S., 15% of the population lives below the poverty line. For children under the age of 18, that number increases to 20% (see U.S. Census). The recent NATO summit in Warsaw was full of contradiction and tensions between members of the alliance. The fragility of NATO’s power and the instability of world relations were on display for all to see. Are there limits to the use of negative policy rates? The use of negative policy rates may have its limits—both in terms of the extent to which central banks can set rates at negative levels and the length of time they can remain negative. Individuals and corporates could substantially increase the use of cash as a store of value—and even as a means of payment—if rates are expected to be substantially negative and for a long time. Indeed, so could banks: instead of working balances held at the central bank to cover interbank transactions, banks could hold vault cash for settlement between each other. Is #dropping #more #bombs on #syria the #way to #solve the #refugee #crisis? The greatest period of economic growth in #US history was when there was no central bank. The #UnitedStates never had a persistent, ongoing problem with #inflation until the Federal Reserve was created. In the century before the Federal Reserve was created, the average annual rate of inflation was about half a percent. In the century since the Federal Reserve was created, the average annual rate of inflation has been about 3.5 percent, and it would be even higher than that if the inflation numbers were not being so grossly manipulated. Even using the official numbers, the value of the U.S. #dollar has declined by more than 95 percent since the Federal Reserve was created nearly 100 years ago. The secret November 1910 gathering at Jekyll Island, Georgia during which the plan for the Federal Reserve was hatched was attended by U.S. Senator Nelson W. Aldrich, Assistant Secretary of the Treasury Department A.P. Andrews and a whole host of representatives from the upper crust of the #WallStreet banking establishment. In 1913, Congress was promised that if the Federal Reserve Act was passed that it would eliminate the business cycle. It was not an accident that a permanent income tax was also introduced the same year when the Federal Reserve system was established. The whole idea was to transfer wealth from our pockets to the federal government and from the federal #government to the #bankers. Within 20 years of the creation of the Federal Reserve, the U.S. economy was plunged into the #GreatDepression. If you can believe it, there have been 10 different economic recessions since 1950. The Federal Reserve created the “#dotcom bubble”, the Federal Reserve created the “#housing bubble” and now it has created the largest bond bubble in the history of the planet. The Federal Reserve also paid those big banks $659.4 million in fees to help “administer” those secret loans. The Federal Reserve has created approximately 2.75 trillion dollars out of thin air and injected it into the financial system over the past five years. This has allowed the #stockmarket to soar to unprecedented heights, but it has also caused our financial system to become extremely unstable. We were told that the purpose of #quantitativeeasing is to help “stimulate the economy”, but today the Federal Reserve is actually paying the big banks not to lend out 1.8 trillion dollars in “excess reserves” that they have parked at the Fed. Quantitative easing overwhelming benefits those that own stocks and other financial investments. In other words, quantitative easing overwhelmingly favors the very wealthy. Even Barack Obama has admitted that 95 percent of the income gains since he has been president have gone to the top one percent of income earners. The gap between the top one percent and the rest of the country is now the greatest that it has been since the 1920s. 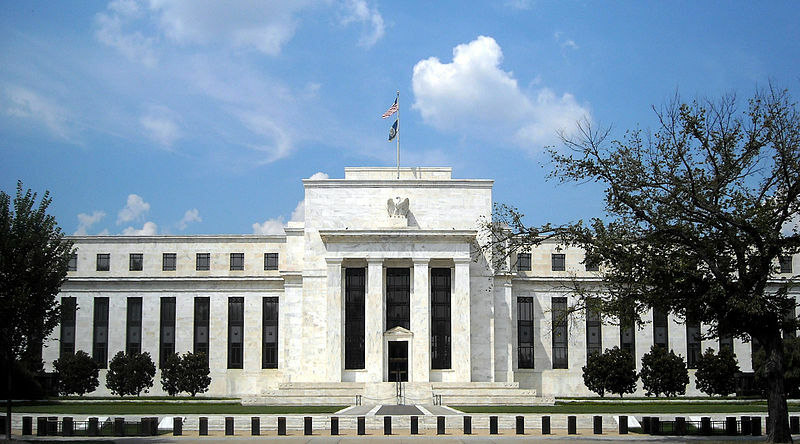 The Federal Reserve has argued vehemently in federal court that it is “not an agency” of the federal government and therefore not subject to the Freedom of Information Act. The Federal Reserve openly admits that the 12 regional Federal Reserve banks are organized “much like private corporations“. The regional Federal Reserve banks issue shares of stock to the “member banks” that own them. The Federal Reserve system greatly favors the biggest banks. Back in 1970, the five largest U.S. banks held 17 percent of all U.S. banking industry assets. Today, the five largest U.S. banks hold 52 percent of all U.S. banking industry assets. The Federal Reserve is supposed to “regulate” the big banks, but it has done nothing to stop a 441 trillion dollar interest rate derivatives bubble from inflating which could absolutely devastate our entire financial system. 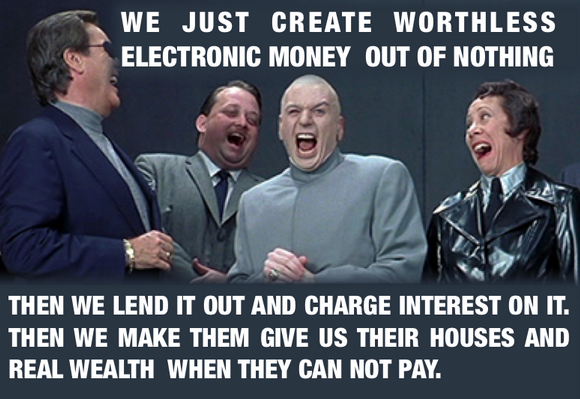 The Federal Reserve was designed to be a perpetual debt machine. The bankers that designed it intended to trap the U.S. government in a perpetual #debt spiral from which it could never possibly escape. Since the Federal Reserve was established nearly 100 years ago, the U.S. national debt has gotten more than 5000 times larger. The U.S. government will spend more than 400 billion dollars just on interest on the national debt this year. If the average rate of interest on U.S. government debt rises to just 6 percent (and it has been much higher than that in the past), we will be paying out more than a trillion dollars a year just in interest on the national debt. According to Article I, Section 8 of the U.S. Constitution, the U.S. Congress is the one that is supposed to have the authority to “coin #Money, regulate the Value thereof, and of foreign Coin, and fix the Standard of Weights and Measures”. So exactly why is the Federal Reserve doing it? There are plenty of possible alternative financial systems, but at this point all 187 nations that belong to the #IMF have a #centralbank. Are we supposed to believe that this is just some sort of a bizarre coincidence?